Share the post "Rutgers Environmental Stewards Program Gets in Gear for 2018"
Environmental Stewards learn the tools and techniques for monitoring stream health at the 2017 stream monitoring training on the Stony Brook in Hopewell. Photo: Michelle Bakacs, county agent and associate professor for Middlesex and Union Counties, Rutgers Cooperative Extension. Since 2005, hundreds of citizen scientists have made the commitment to protecting New Jersey’s environment by participating in the Rutgers Environmental Stewards Program. 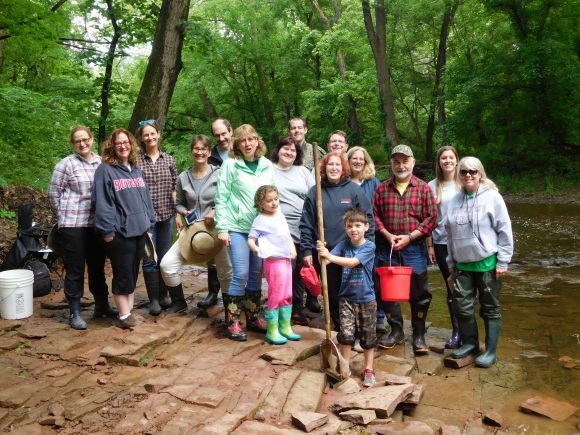 Offered by Rutgers Cooperative Extension, this 20-week program trains volunteers in important environmental issues affecting New Jersey, enabling them to solve problems in their respective communities. Starting late January this year, the program is being offered in four different New Jersey counties, Passaic, Somerset, Union and Atlantic. Stewards do not have to be county residents. The program costs $250. Stewards start out by attending class once a week on topics including climate change, soil health, energy conservation, water resource protection, invasive species management, open space management, habitat conservation, protecting pollinators, environmental policy and more. Optional field trips to environmentally significant sites around the state are included as part of the program. The program introduces non-scientists to the science underlying key environmental issues in the Garden State. Leading researchers from Rutgers are joined by colleagues from government and the non-profit sector to share their knowledge with the Stewards and help them make a difference in their own communities. In order to become certified, graduates of the class portion of the program must complete a 60-hour volunteer internship of their choosing. Internships are unique and intended to align with the passion of the individual and the needs of the program and community. Steward internship projects have included monitoring shorebird populations, composting restaurant food waste, mapping and eradicating invasive species in local parks, restoring native dune vegetation in shore communities, and creating rain gardens, among others. The classes, field trips and internship do not replace a science degree, but helps citizens educate themselves when presented with a real world environmental problem. Stewards are introduced to a network of expert individuals and organizations who can be of service to them as they wrestle with solving local environmental problems. For more information, contact Pat Rector, coordinator of the Rutgers Environmental Stewards Program by email at rector@njaes.rutgers.edu or by phone at 973-285-8303.